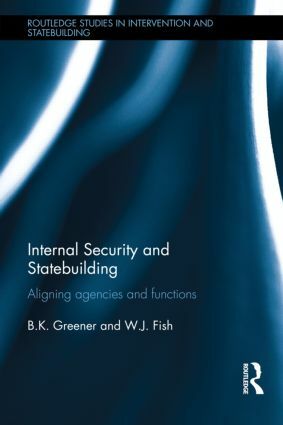 This book examines international efforts to provide security in post-conflict sites and explains why internal security should be given precedence in statebuilding endeavours. The work begins by exploring the evolution of security sectors in mature liberal democratic states, before examining the attempts of such states to accelerate that evolutionary process in post-conflict sites through statebuilding and security sector reform. These discussions suggest interestingly different answers to the question of who should provide for internal security in international operations. When considering mature states, there are both practical and normative reasons as to why internal security has become the sole domain of police, with military forces being excluded from internal affairs. In peace and stability operations, on the other hand, difficulties with utilising police personnel have led to military forces being required to play internal security roles. This tension is investigated further through detailed case studies of three recent missions: Afghanistan, Timor-Leste and Solomon Islands. These case studies both reinforce and augment the practical and normative reasons for ensuring that internal security remains the domain of police. This then impacts upon peace and stability operations in two important ways. If we are to provide enduring security in post-conflict sites, we should both (i) prioritise internal security agencies in security sector reform efforts, and (ii) prioritise ways of enabling police to play internal security roles in the contributing mission. This book will be of much interest to students of statebuilding, peace and conflict studies, military studies, police studies, historical sociology, security studies and IR in general. B. K. Greener is Senior Lecturer in International Relations, Massey University, New Zealand, and author of The New International Policing (2009). W. J. Fish is Associate Professor of Philosophy, Massey University, New Zealand, and author of Philosophy of Perception: A Contemporary Introduction (Routledge 2010).